This new translation of the great classic of Ancient Greece starts a cycle of drama recordings by Naxos AudioBooks. 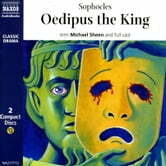 The anguished tale of Oedipus, who having solved the riddle of the Sphinx and become King of Thebes, gradually realises the crimes he has, unwittingly, committed, remains a drama of unremitting power 2,500 years after it was written. With full drama values, Naxos AudioBooks the atmosphere of the Greek amphitheatre to the soundworld of CD, with the outstanding young actor Michael Sheen recently seen as Henry V (RSC) and Amadeus (West End) and on film and TV.